Who unlocked door at a glance. 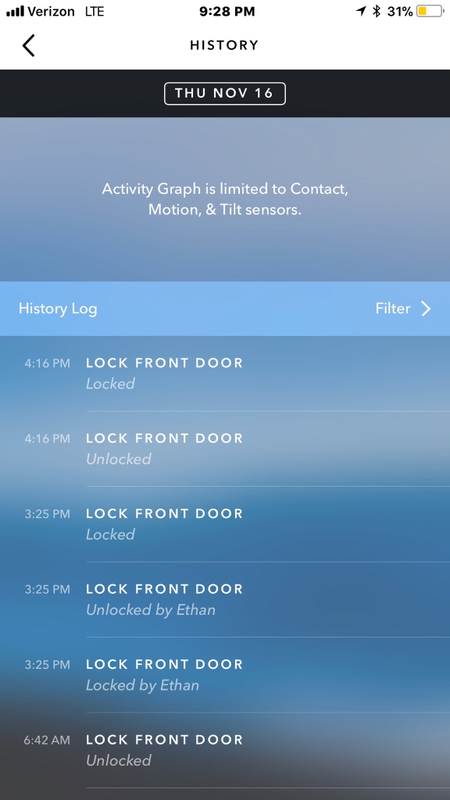 I would like to get a notification when the Schlage door lock is unlocked that tells me in the notification who unlocked the door. I don’t want to open the app and look at history each time. I agree. Also I wish that I didn't get alerted when the door is unlocked from the inside. I only want to know when someone unlocks the door using a PIN and which person's PIN was used. It would be nice to have a separate rule that lets you know when the door is unlocked form the inside. At the moment there's no way to tell unless you look at the app history where it will say who it was, if the pin was used. Very good point. I agree 100%! @TreeFiddyTech and @ade194 if you filter the history by the device does it show then ? [mention=5332]TreeFiddyTech[/mention] and [mention=121]ade194[/mention] if you filter the history by the device does it show then ? Shows “Unlocked” when manual turn of the knob happens on the inside of door. Shows persons name when code is used. @TreeFiddyTech hover your mouse over the book icon on the device in the web portal.